When the bell rings and the doors open for recess, kids everywhere make a beeline for their favorite spot on the playground. From swings to monkey bars, the typical school playground features a wide variety of structures and equipment that kids can enjoy a bit of unstructured, active play on to help break up the monotony of the school day. Those same structures can present a bit of an injury risk, though. In fact, the United States Centers for Disease Control and Prevention estimate that more than 156,000 kids under the age of 14 will visit the emergency room each year as a result of sustaining an injury on a public playground. Whether it’s a result of taking a header off the top of a jungle gym or attempting to leap out of a swing at the peak of its arc, falls are the single most common cause of childhood injuries on the playground. Data collected by SafeKids USA estimates that up to 75% of all playground injuries can be attributed to a simple fall. Short of discouraging risky behavior and hoping that the teacher is supervising her students carefully during recess, there’s little you can do to prevent falls from happening while your child is on the school playground. You may want to make a trip to the recess area yourself, though, just to be safe. Check for protective surfacing like shredded rubber, sand or padding, especially under high structures and swing sets. Make sure that your kids know to never go down the slide with a friend, as tibia fractures can happen when the leg of the child in front becomes stuck and the child behind him cannot stop moving down the slide. 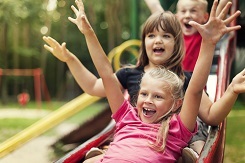 The vast majority of these injuries are caused when small children ride down a slide in the lap or between the legs of an adult, but it’s still best to err on the side of caution when it comes to teaching kids a “one at a time” rule for using the slide. One terrifying and tragic playground injury that’s more common than many parents realize is strangulation. Cords and pulls from hooded shirts or jackets, hoods themselves and other loose clothing can become tangled around bars and ropes on climbing structures, presenting a very real strangulation risk if a child should fall from that structure. Make sure that you remove the cords and drawstrings from any hooded garment your child owns, and consider investing in winter jackets with detachable hoods that your child can easily remove on her own before heading outside for recess. Though most schools are taking huge strides when it comes to enforcing zero-tolerance bullying policies, it is still a problem for a large number of schoolchildren. The playground is one of the more common places for bullies to strike, especially if there are secluded or obstructed areas where they can accost victims without being easily seen by teachers or school administrators. With the crush of other kids and hectic pace of activity, it’s not always easy for teachers and supervisors to see the actions of one or two kids in particular. If your child is being victimized by a school bully, it’s wise to consult with school administrators and your child’s teacher to reach a solution that will keep your child safe. When it comes to playground injuries, there’s not always much a parent can to do prevent them outside of taking precautions by removing drawstrings, dressing children appropriately and hoping for the best. One of the most effective ways of helping to keep your child safe is instilling a healthy respect for rules and guidelines, and making sure that your child knows what he should and should not do on the playground. Some kids are just naturally more willing to take chances and engage in risky behavior than others, and knowing how likely your child is to take on dangerous activities can help. Talk to your child about the importance of making safe choices and being careful on the playground, and look for everyday teaching opportunities to drive the point home.